Ramadan Kids’ Table Crayons – Hello Holy Days! Make Ramadan special at the kids’ table with this fun place setting idea. Use our printable template for the mosque shape – and for the minaret? A crayon! Lay out kraft paper as a tablecloth and let kids colour with the crayons till sunset. Place extra crayons at the table to ensure that there are no tears over colours. Download and print clipart. 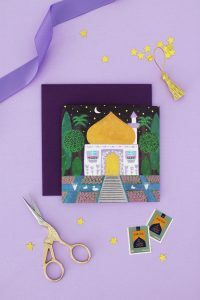 Trace the mosque shape on dark purple paper and the door onto light purple. Cut out shape and glue the door onto the mosque. Use a black marker to draw a line along the dome. Curl up the side of the template to form a cup and place crayon inside. Secure tightly with tape. Place one mosque on every child’s plate to keep them busy before dinner is served. For more colouring fun, have you seen Crayola’s Ramadan colouring pages? A very interesting activity for kids. Thank you for sharing. My 2 year old is so excited to make these.